By Anton Hieber, Elektro Hieber. 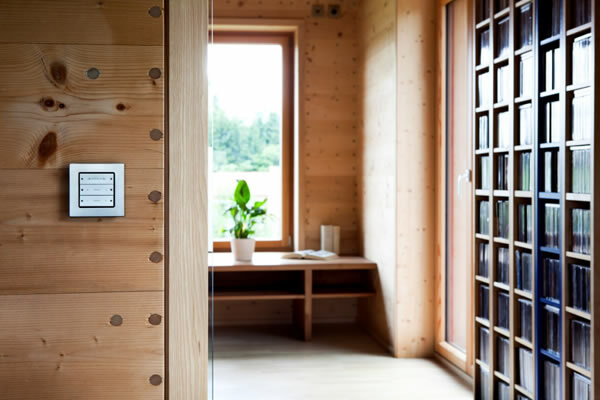 For this very special wooden house, located in the middle of a flowering meadow in the Dachau Hinterland, Germany, we worked closely with ecologic entrepreneur Erwin Thoma to combine natural products and KNX solutions to create a one-off installation. The totally wooden house in a flowering meadow. 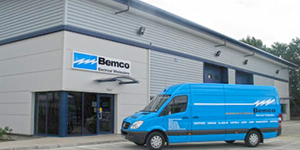 Being eco-friendly was one of the main objectives of this project. The residence had to take maximum advantage of local natural materials and freely-available resources such as sunlight, rainwater and daylight. 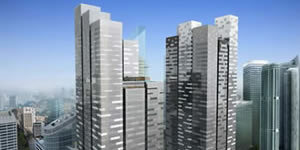 The house also needed to be future-proof and use cutting-edge intelligent building technology. During his research, the homeowner discovered the KNX standard and decided to visit our HieberTech showroom at the Gira Revox Studio in Augsburg to look at solutions and try them out. 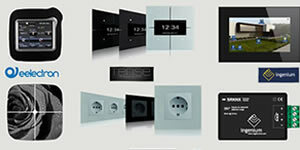 We recommended Gira’s KNX product line because it specifically fitted the requirements of the project. As the owner didn’t want to use any plastics in his new home, he decided on the Gira E22 switch series made of stainless steel, which is a distinctive contrast to the wood and glass used in the construction. At ElektroHieber, we were responsible for the entire planning and programming of the home technology, while Elektro Ernst was commissioned to do the installation. 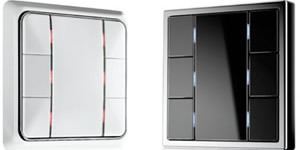 Gira E22 wall-mounted push button sensor (top) and Twilight motion detector (bottom). The homeowner’s wish to have a totally natural wooden home became a reality thanks to the help of Erwin Thoma and his team. The house was built in 2011 using spruce, larch, pine and birch wood, all from the surrounding woodland area, and no chemicals or artificial tools were used in its construction. The building is made only of wood, without glue, screws or nails. The living space is spread over two floors, and the staircase is elegantly integrated in the architecture. 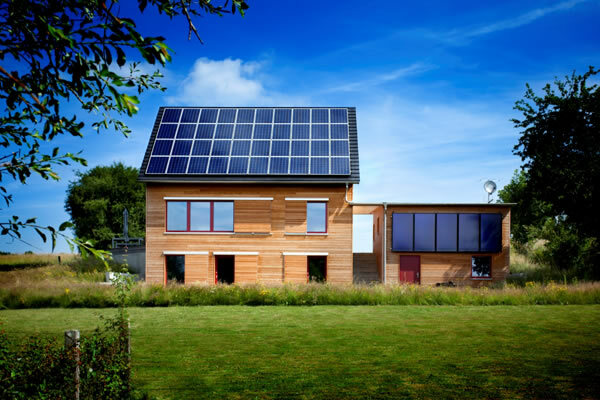 The house features a photovoltaic system, solar energy, a heat pump and intelligent building technology from Gira, with the result that it has nearly zero energy consumption. When it comes to electricity, for instance, the house produces more than it actually consumes. 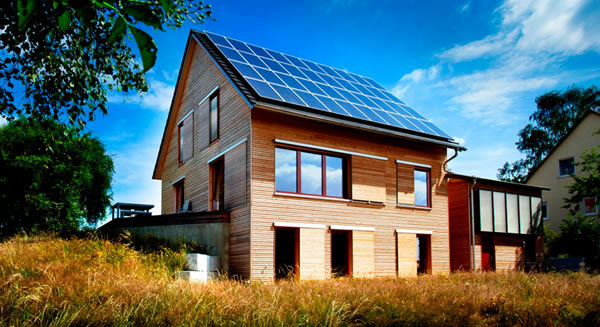 Thanks to photovoltaics, solar energy and intelligent building technology, the solid wood home provides a healthy and ecological environment, and is almost zero-rated in terms of energy consumption. 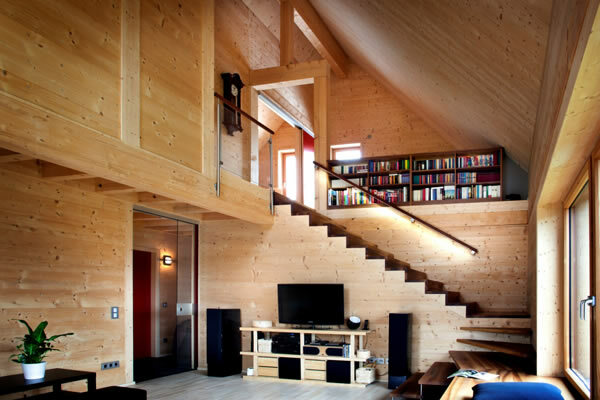 The walls, ceilings and roof consist of wooden elements, which are up to 40cm thick, consisting of a combination of spruce and pine. Rugged larch was used for the façade and the windows, while floors and doorframes are made of ash, and the stairs and bench under the window are made of walnut. Almost the entire range of native tree types of the area were integrated in this fairy-tale- style house. Almost the entire range of native tree types of the area were integrated in the house. A piping system was laid below the meadow, coupled to the geothermal energy pump which is used to heat the home. A solar thermal system is installed on the south wall of the garage to heat the service water, and all excess solar energy is guided to the ground, which makes the heat pump run even more efficiently. The wooden boards and beams were layered horizontally, vertically and diagonally to the structural elements. To fasten them in place, the pieces are connected with extremely dry beech plugs, which take on moisture when positioned. The moisture makes them swell and consequently form a stable joint. 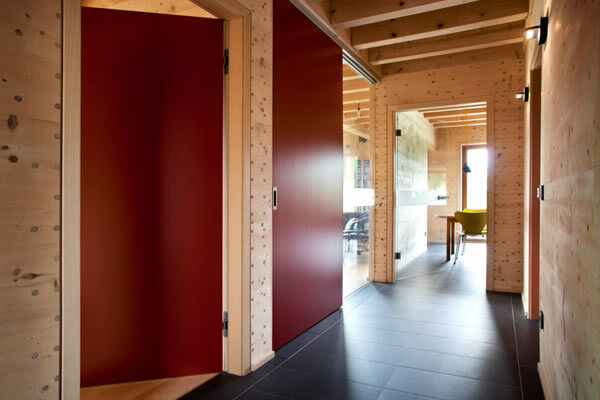 Wood makes up 100% of the building shell, which was built without using glue, screws or nails. Joints are made using beech plugs. The thermal insulation of wood is also impressive. 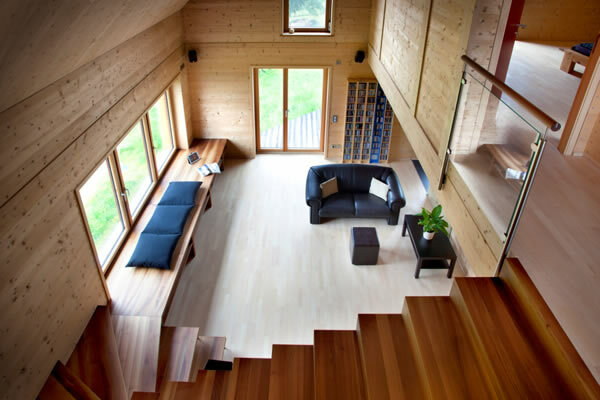 Thick solid wooden walls keep the house cool in summer and warm in winter. It also offers better noise and fire protection than a home with a conventional brick or reinforced concrete construction. 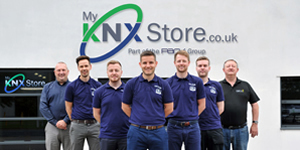 A powerful KNX system links all of the electric components in the home. The Gira HomeServer is the intelligent central control unit in the background, where all of the information merges and is analysed. For example, heating, lighting and sliding shutters are integrated into the system, and the temperature can be set individually for each room. At the press of a button, entire light scenes are called up on Gira push-button sensors. Switchable socket outlets and standard lamps are also integrated. The light in the hallway is activated using motion detectors, while Gira flush-mounted radios set the mood in the kitchen and bathrooms. 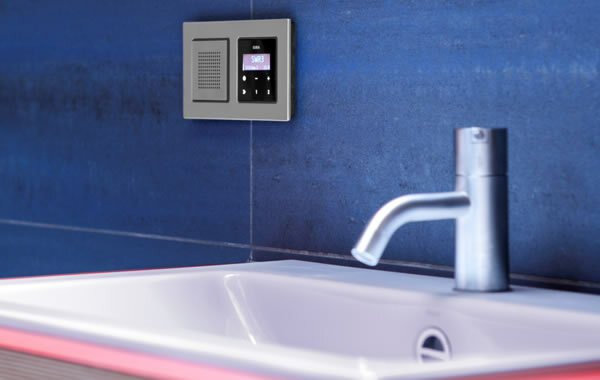 Gira flush-mounted radios set the mood in the kitchen and bathrooms. When the doorbell rings, the Gira home station on the upper floor can be used to speak to the visitor and open the door, and Gira motion detectors activate the light as needed. 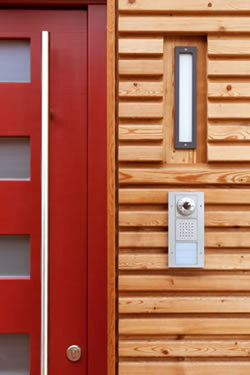 Door entry featuring video and intercom. The central ‘off’ function is a real boon. 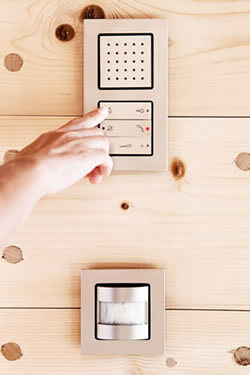 Using this function, the owner can switch off all energy-consuming devices at the press of a button when leaving the house. In addition, thanks to the installed window contacts, he can see whether and where a window is open. 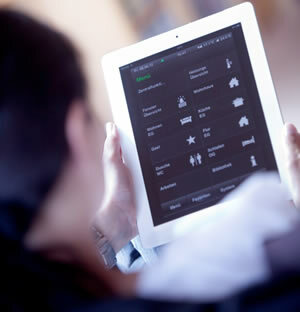 The home technology is controlled via the Gira Interface application via iPad, iPhone or office PC. The Gira Interface application can be accessed through an iPad, iPhone or office PC. Having planned the project carefully in collaboration with Erwin Thoma and Elektro Ernst ensured that no surprises were encountered. In terms of future proofing, provision has also been made for easier access in case it might be needed when the owner reaches an advanced age. All living areas can be relocated to the ground floor and the doors and hallways are wide enough to make the home wheelchair accessible. The owner’s favourite place is the bench in front of the window. This type of installation can truly raise the bar in terms of green home standards. The photovoltaic system installed on the roof facing south, generates approximately twice as much electricity as the owner consumes in his home. Everything went to plan, and our collaboration with the other parties was smooth, resulting in the best result for the client that we could have hoped for. Solarworld Sunmodule Plus SW 235 Poly. Gira E22 stainless steel push button sensor. Gira Interface controlled on an iPad, iPhone or office PC. Gira door communication with video function. Anton Hieber is Director at Elektro Hieber, specialist in southern Germany for consultation, design and installation of KNX technologies in residential, commercial and industrial buildings. This is a very good and so interesting project, I hope more and lots more projects like this in even larger scale will come in the future. Of course with the proper balance and protection of our wood source, this will be possible. It is very nice for the people to share some details about this project. I would like to work for wood structure projects in the coming years, first I have to build my skills and knowledge. I just wonder how big is the difference in total installed cost if the natural material is abundant in the area like yours, compare to using modern materials like concrete? How is the noise from outside or from each individual rooms insulated? Were there heating system for 2nd or 3rd level of the house also? I like so much how woods structure was built without nails, screws and even without glue. Must be using a lot of Japanese joint techniques. I hope for more projects to your team, so you can share more.